Today, an important step has been taken for the rewilding of the Central Apennines, by the signing of a Memorandum of understanding between Rewilding Apennines and the Abruzzo National Park. The document was signed by Antonio Carrara, President of the Abruzzo NP and Alberto Zocchi, Chairman of the Rewilding Apennines Association and leader of the local rewilding team. The cooperation between the park authority and Rewilding Apennines is crucial in addressing some key challenges in the protection of the Marsican brown bear, and exploring new innovative solutions and opportunities. Rewilding Apennines, that started working in the area in January 2014, has concentrated its efforts so far on the areas surrounding the Abruzzo NP, with a focus on yet unprotected ecological corridors that connect the park to other large protected areas in the Apennines. –”We see this agreement as a major step forward,” says Alberto Zocchi. ”It paves the way for a very fruitful cooperation between us, the local communities and the Abruzzo NP for a long period looking forward, with an agreed strategy that combines nature conservation and rewilding with business, jobs and income in all the communities around the park”. The main goal is to work together to engage and involve the local communities from the surrounding areas, which are included in the National Park buffer zone, in saving and bringing back the endangered Marsican brown bear. For example by creating safer connection corridors between the park and the other protected areas nearby, which would allow the bears to more easily recolonise these other areas and expand the species’ home range – hopefully leading to and a more viable bear population. 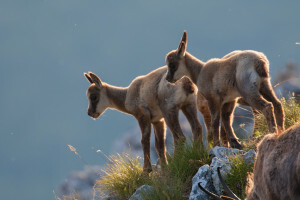 Apennine chamois (Rupicapra pyrenaica ornata) kids/juvenile in late spring. Endemic to the Apennine mountains. Abruzzo NP, Italy. The rewilding team and its three ”Bear Advocates” are now going to cooperate in a number of ways with the National Park authorities, for example around wildlife monitoring, hunters’ involvement, wildlife tourism development, surveillance and communication work. Established in 1923, the Abruzzo National Park is one of Italy’s first and finest protected areas. It hosts the last population of Apennine, or Marsican brown bear, together with strong populations of other wildlife, like the endemic Apennine chamois, wolf, red deer, wild boar and many other charismatic species. In this marvelous park, itself once rewilded, can also be found some of Europe’s oldest beech woods. All of it bordering to beautiful ancient villages, with open lands that were earlier used for grazing – strong values which rightfully already attract hundreds of thousands of visitors every year, coming from all over the world. 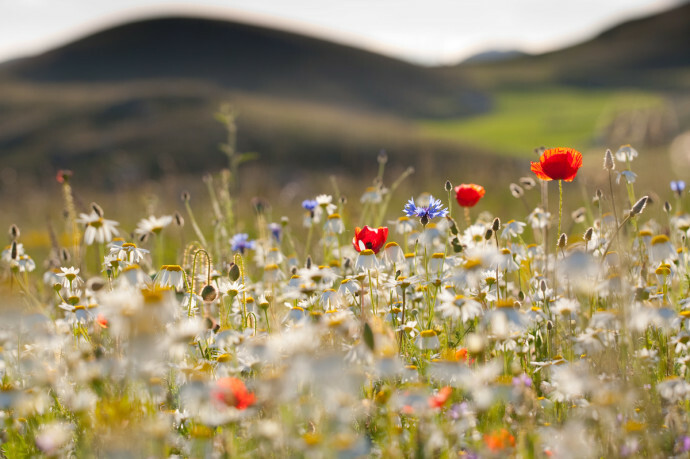 The work of Rewilding Apennines is financially supported by Fondation Segré and the Dutch Postcode Lottery, through Rewilding Europe.